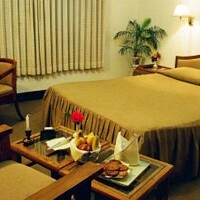 Amid the Nature’s kaleidoscopic manifestations in Pokhara, Hotel Tulsi (Pokhara) Pvt. Ltd. secures its place by the Lakeside, the tourist hub of Pokhara. Thirty-five luxurious twin & double-bed rooms adorned with elegant furniture, modern-day amenities; air-conditioned, multi channel Television, global communication net-work, 24 hours hot/cold running water, and the most exciting of all, the breath-taking views of fish-tail mountain peeping every morning an the serene, blue water lake, dotted with hundreds of rowing boats, through-out the day. The chilling wind ruffling through the waters of lake early morning reinvigorates the hotel, and the Fish-Tail shakes off those flirting fogs to peep through the windows into the hotel rooms. Tulsi offers every thing that a holiday maker aspires for in this beautiful piece of land.